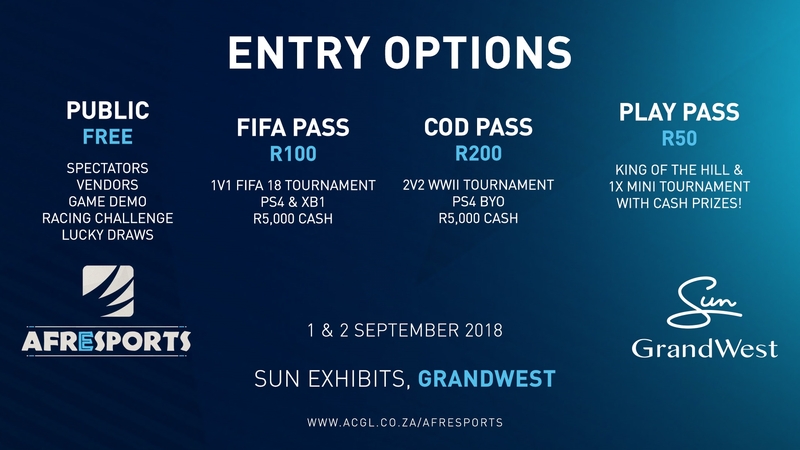 African Cyber Gaming League (ACGL) have announced and detailed their second Afresports event. The first was hosted in February this year and featured Call of Duty, FIFA and a variety of other titles with around R50,000 in cash on the line. Event two heads back to the Sun Exhibits venue at GrandWest in Cape Town and will see a similar format and series of titles. So far Call of Duty and FIFA 18 have been confirmed and detailed with registrations now open. Additional titles are still to be announced. The second Afresports brings a focus on duos and pairs as the two main titles wind down before their next iterations arrive. Call of Duty will feature a 2v2 tournament on Saturday, while free-for-all will be Sunday’s mode. FIFA 18 sees the reverse happen with the traditional 1v1 on Saturday and a 2v2 on Sunday. The FIFA on Saturday will be played over a number of heats with a total player cap of 96. The event will also offer a number of entry options. Spectators can attend the event for free and will also have access to vendors, freeplay and a few other elements. Competitors keen to participate for cash will be charged to participate. Competition pricing ranges from R50 to R130 per player. To find out more on the event and sign up for the tournaments, we suggest you head over to their event landing page.